Greek Revival style home plans quickly sprang up in the South. Often these symmetrical, columned homes were called Southern Colonial houses. Prosperous Americans in the mid-19th century thought ancient Greece represented the spirit of democracy. So, American’s interest in British styles tapered and soon a Greek revival occurred. With simple lines, a symmetrical shape, and simple moldings, this style of home became very popular. Other features of Greek Revival architecture include gable roofs and square or rounded columns. Thomas Jefferson popularized Greek Revival style because of his support of the Greek democratic ideal. He even built the Virginia State Capitol building in this style in 1785. The Spencer Trail Prairie Home has 3 bedrooms and 2 full baths. 1720 Sq. Ft., Width 62'-0", Depth 55'-4"
The McKinley Georgian Style Home has 4 bedrooms, 2 full baths and 1 half bath. 2410 Sq. Ft., Width 62'-0", Depth 36'-0"
The Gillian Georgian Style Home has 4 bedrooms, 2 full baths and 1 half bath. 3622 Sq. Ft., Width 77'-8", Depth 88'-9"
3231 Sq. Ft., Width 56'-0", Depth 46'-0"
The Brewton House Georgian Home has 5 bedrooms, 4 full baths and 2 half baths. 4465 Sq. 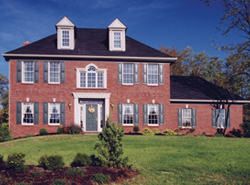 Ft., Width 74'-8", Depth 93'-10"
The Bristol Lane Georgian Home has 4 bedrooms, 4 full baths and 1 half bath. 3280 Sq. Ft., Width 49'-10", Depth 100'-6"
The Broadland Traditional Home has 4 bedrooms, 3 full baths and 1 half bath. 4294 Sq. Ft., Width 91'-10", Depth 57'-2"
The Capital Colonial Home has 4 bedrooms, 3 full baths and 2 half baths. 3117 Sq. Ft., Width 64'-8", Depth 65'-10"
The Drum Bay Colonial Home has 4 bedrooms, 3 full baths and 1 half bath. 2474 Sq. Ft., Width 50'-2", Depth 71'-1"
The Easton Lane Colonial Home has 4 bedrooms, 4 full baths and 1 half bath. 2298 Sq. Ft., Width 44'-4", Depth 60'-0"
Greek Revival house designs have an orderly appearance thanks to their symmetrical exterior and bold, sturdy columns across the front facade. Their style definitely instills a feeling of stability and their classic appeal appears to span decades and is still widely used today in all types of building both residential and commercial.